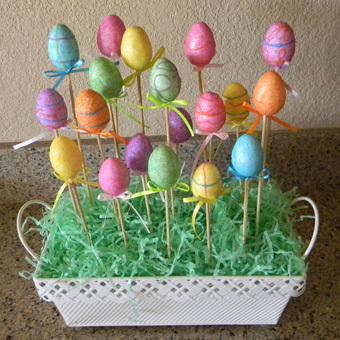 Here's a round-up of some of my favorite Easter craft ideas for kids! Some of these crafts will be easy for preschool kids, and some crafts will better for older kids who are learning to sew. These all are great craft ideas that are absolutely CUTE, adorable, and a fun way to celebrate Easter. This is a cute preschool or kindergarten craft idea from Oriental Trading's Free-N-Fun Easter site. Cut out a white lamb shape, ears, purple legs, and glue them together. Spread a thin layer of glue on the body of the lamb, and let your little one place the popcorn pieces on top of the layer of glue. Let it dry. Why not dress up your already dyed eggs with some fun stickers. Use a hole puncher to cut out small circles out of colored paper, and glue them on the eggs to make a creative design! This one is from BHG. Welcome your guests with this colorful Easter wreath. Glue foam eggs shapes (or even paper) together and decorate with stickers. I made this in 30 minutes – see the Easter wreath tutorial here. This cute and easy Easter egg centerpiece comes is from Simply Crafty. All you need are pre-made egg picks from the dollar store, easter grass, foam block, and container. Love that this craft is quick and inexpensive! This topiary from the Crafty Sisters is another easy craft. Insert a craft stick into a foam ball, add the jelly beans with hot glue, and insert into a foam base that is inset into a flower pot. Add moss on top. Make sure you have adult supervision for this one, especially with the hot glue gun! All you need for this adorable craft are colored paper and scissors! Cut out an egg shape out of paper, fold it in quarters, and start cutting your patterns. This is a good craft for kids who are working on cutting skills and shape recognition. Instructions for this Easter paper craft are here. This Easter Peeps banner is for the more advanced crafter. You'll need the bunny bunting pattern from Dana Made It, cut out your felt bunnies, sew the bunnies, and add them to the ribbon. You'll see detailed instructions at Dana Made It. These look scrumptious! The Curvy Carrot used chow mein noodles, peanut butter, butterscotch chips, chocolate chips, and mini Cadbury eggs to make this festive treat! What kid wouldn't love these adorable carrot patch cookies? Make the outline of the garden bed with sugar wafer cookes and attach with chocolate frosting. Fill the beds with frosting and chocolate wafer cookie crumbs. Use orange Mike and Ike candies to make the carrots and green gummy candy to make the carrot tops. This is from Spoonful. This would make a great Easter treat for your child's classmates or Easter basket filler! Add 2 peeps, some graham crackers, and a chocolate easter bunny to a bag. This is a cute, easy, and sweet treat from Scrappin' with My Bug. I hope these ideas helped inspire you to work on some Easter crafts with your kids! Have a great week and happy Easter! Here is an Easter wreath craft that is quick, easy, and fun to work on with your kids. All you need are some foam egg shapes, decorative stickers, tacky glue, and ribbon! I bought pre-cut foam eggs and foam stickers from JoAnn, but you could also cut out your own eggs with foam sheets or even cardstock. This craft took about 30 minutes. 2. Lay them out in a circular pattern first, before you glue them down. This is important because you want to make sure they are adequately spaced. I used an alternating pattern of colors, and also put the glittery eggs next to the plain eggs for more contrast. 3. Once you've laid the eggs (no pun intended!) down, you can start to glue them together with tacky glue. I used Aleene's tacky glue, which you can purchase from a craft store or Amazon.com . You kind of have to eyeball where the top egg with land on the lower egg when you squeeze the glue out onto the lower egg. 5. This step will be the most fun for your kids. I used self-adhesive foam stickers, also from Joann's Holiday Inspirations line. I decided to leave the green foam stickers out, since the wreath is blue, pink, yellow, and white. 6. Now, you can place the foam stickers on the wreath! 7. I cut some pink ribbon, added some glue dots to the ribbon and adhered it to the back of the wreath to hang. That's it! It's a quick and easy Easter wreath craft you can put together with your kids. My kids loved the bright Easter colors and adorable Easter bunnies and chicks on this wreath. Since I'm hosting Easter at my house this year, I thought Easter bowling would be a great indoor activity for the kids. We made these cute Easter bowling pins with plastic eggs that were already decorated, toilet paper rolls, and cardstock. This was a fun craft for my kids and they'll have festive bowling pins ready to go for our party! 1. We used eggs that we had already decorated with our foam kits, but you could use plastic eggs decorated with stickers, or plain plastic eggs at all! You'll need to start with 6 toilet paper rolls, and 3 pieces of 8.5×11 cardstock or colored paper. 2. Cut your colored paper to 4.5 x 5.5 inches using a paper trimmer or scissors. This will cover your paper roll. 3. Apply adhesive to the edges of your cardstock. I used a Scotch ATG (Advanced Tape Glider), but you could probably also use a glue gun or tacky glue. If you're using tacky glue, you'll need to hold the paper down until it bonds. 4. Align the toilet paper roll to the edge of the paper, with adhesive side up. 5. Roll the toilet paper tube to secure the paper to the tube. You'll see here that it isn't perfectly aligned, but that's okay! The bowling pin will still stand on it's own. 6. For extra security, you'll need to add three staples to the back so the cardstock doesn't come off the paper tube. 7. Now add 4 glue dots to the lower half of the plastic egg, so the egg won't fall off while your kids are bowling. 8. Place your egg on top of the paper roll – the glue dots will secure the egg to the paper roll. And here are the finished bowling pins! Now we have a fun, low-cost Easter party game for the kids. My daughter had a blast with this DIY bowling game! Have fun and hope your kids enjoy! This Easter egg "snowflake" paper craft is great for younger kids who are working on their paper cutting and shape recognition skills. My 5-year old daughter loved making these – and I loved hearing her "ooh" and "ahh" over the shapes we were creating in the paper! She's learning about rhombuses, hexagons, pentagons, and other geometrical shapes now in kindergarten. I love crafts that have an educational component! We hung these Easter "snowflake" eggs as decorations on our windows. They look great when the sun is coming through. All you need is some colored paper – we used thin scrapbooking paper (the thinner the better) to make these Easter "snowflake" eggs. Step 1 – The first thing you need to do is trace an egg shape on paper. We used a 12×12 piece of scrapbooking paper. My daughter cut out the egg shape. She folded the egg in half, and then half again to quarter. We cut a design in the corner to make the center design in the egg. Step 2 – At this point, you could fold the paper in half again, and cut more shapes out, but if you want a more intricate design, it's easier to leave the paper as is and cut through the folded parts of the paper. Be careful not to cut on the outer edges of the egg if you want to keep a seamless edge. Step 3 – When you've cut enough shapes on the fold, fold the paper again (only once) and cut more shapes. You will need to repeat this until you have "filled" your egg with cut-out shapes. You can see the fold lines in the paper below. Step 4 – Unfolding the egg was the to reveal the shapes, was the best part for my daughter! This is where she discovered and named the many shapes we created! Here is the completed green egg! This is a fun craft that only requires paper, scissors, and an imagination! Please make sure you are using kid-safe scissors and are supervising your child at all times!